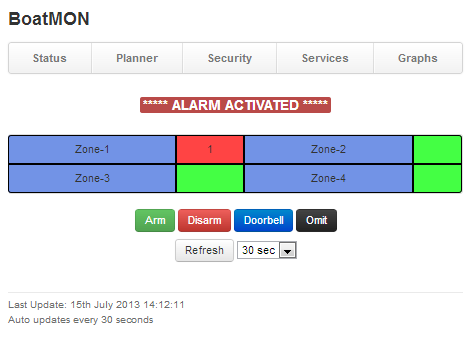 BoatMON features a four zone security system that uses industry standard wired detectors and sirens. Operation is simply through the web interface available on any smart phone or tablet. You can see instantly the state of the security system and set/reset from close by using the WiFi network or from any where in the world as long as you have internet access. As well as operating an optional local siren email alerts will be sent to you in the event of anything untoward happening.